Have you got a passion for air rifle and air pistol shooting? Technical advancement in gun mechanics means that changes in shooting have been swift and numerous. Here are a few historical and scientific facts behind the popular sport. In 1780, Italian watchmaker and gunsmith, Girandoni Bartolomeo, invented a 51-calibre rifle, capable of firing up to 20 bullets a minute. The Girandoni rifle was widely used in Europe for big game hunting. A single shot could take down a deer or wild boar. These early airguns had significant advantages over the primitive firearms of the times: they were quieter; they had no smoke or muzzle flash; they could be discharged in wet weather; and they could be discharged faster – i.e. more times per minute. 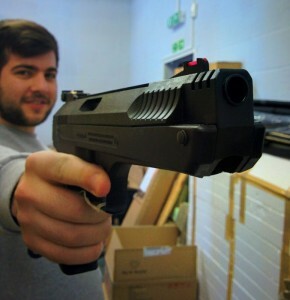 Birmingham is the cradle of airgun target shooting. In the 1890s, public houses in Birmingham began holding competitions, with prizes for the winning team (leg of mutton, for example) paid for by the losing team. By 1900, there were more than 4,000 rifle clubs and associations in Britain. A large number of these were in Birmingham. You may have even seen the likes of BSA mentioned in the Netflix series of Peaky Blinders. The Society of Working Men’s Rifle Clubs (SWMRC) was established in 1901 to promote civilian rifle clubs in Britain. Its first president was Earl Roberts of Kandahar, who was also the first president of The Pilgrims Society, established in 1902 ‘to promote good will, good fellowship, and everlasting peace between the United States of America and Great Britain’. In 1903, the SWMRC amalgamated with the British Rifle League to become the Society of Miniature Rifle Clubs (SMRC). In 1947, the SMRC changed its name to the National Smallbore Rifle Association (NSRA). Based at The Lord Roberts Centre, in the grounds of the National Shooting Centre, Bisley Camp, Surrey, the NSRA is the governing body for all small-bore rifle and pistol target shooting in the UK. Picking the right shooting accessories for the job can make all the difference. The diabolo pellet is designed with a forward weight bias, a pinched waist (or ‘wasp waist’), and a hollow skirt. The heavy nose keeps the pellet pointing in the right direction, while the pinched waist and hollow skirt produce a high air drag on the tail, which stabilises the pellet. A rifled bore provides additional stability by spinning the pellet, but a diabolo pellet can be fairly accurate even when discharged from a smoothbore gun. The word ‘diabolo’ originates from the Latin diabolus, meaning the Devil. When the speed of sound is broken, a shock wave is created. So when a pellet is discharged at or above supersonic velocity (in normal conditions, that’s about 1,100 feet per second), it produces a shock wave behind it. As the pellet loses speed, the shock wave catches up with the pellet, causing it to tumble. This turbulence, of course, is detrimental to accurate shooting. Experienced shooters ensure that their pellets leave the barrel at no more than about 900 feet per second, because turbulence can be created even when the sonic barrier is approached. Some guns are built for supersonic muzzle velocity, and when using one of these guns, an experienced shooter will select the heaviest pellets available in order to reduce muzzle velocity. A wide range of air rifles and air pistols can be purchased from Pellpax, as well as pellets, specialist clothing, and all shooting accessories.